Team Sahlen, presented by honeybeeBase.com , returned to the American Endurance Racing event at Mid-Ohio seeking to recapture the overall victory the team had secured in 2015. 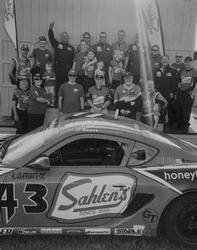 Then in 2016, Team Sahlen had finished in 2nd place in both Saturday’s and Sunday’s 8 ½ hour events. The competition has continued to get better and better each year in American Endurance Racing. This meant that Team Sahlen would have to dig deep to make improvements. Qualifying on Friday was beautiful blue skies. A large amount of race cars on the short 2.25 mile Mid-Ohio course meant finding a clear lap would not be easy. At the end of the day, Team Sahlen found a enough clear track to secure the Pole Position and 5th overall to start Saturday’s 8 ½ hour enduro. Saturday’s race started cleanly, with both Team Sahlen Porsches running smoothly at the front. At one point, both Caymans were in the top 3 overall. New car gremlins saw the #44 “Saucy” sidelined with some electrical issues. #41 “Lunatic” continued running at the front, leading the way. Then with only 3 hours to go in the race, a broken driveshaft sidelined the #41 out of the lead pack. For Sunday, Team Sahlen rolled their #43 “Pepper” out of the trailer to take the place of the sidelined #44 “Saucy”. This tried and true Cayman had won for Team Sahlen earlier in the year at American Endurance Racing’s Watkins Glen event. So there was strong belief in the team that there could again be 2 strong Team Sahlen race cars up front. The race started with Team Sahlen running a steady pace, sitting in 3rd and 4th. Then an electrical gremlin struck the #41 “Lunatic” racer. This left #43 “Pepper” to fend by itself for the remainder of the 7 hour event. As the race moved forward, Team Sahlen used excellent pit strategy during a full course caution in hour two to leap frog into the lead. From this lead, Team Sahlen never looked back. By the end of the 8 ½ hour race, Team Sahlen had an 8 lap lead over the competition. The mission had been accomplished with the Overall and Class 5 Victory. To top off the day, Team Sahlen also led the most laps and set fastest race lap. Team Sahlen’s next and final race of the 2017 race season will be with American Endurance Racing at the National Corvette Motorsports Park in Bowling Green, Kentucky. The dual 9 hours races will be on November 18th and 19th. The team will be campaigning their Porsche Caymans in the Class 5 in hopes another Overall Victory to cap the season off.